Seaway Express provides reliable and efficient overnight transport service between Eastern Ontario and Quebec. 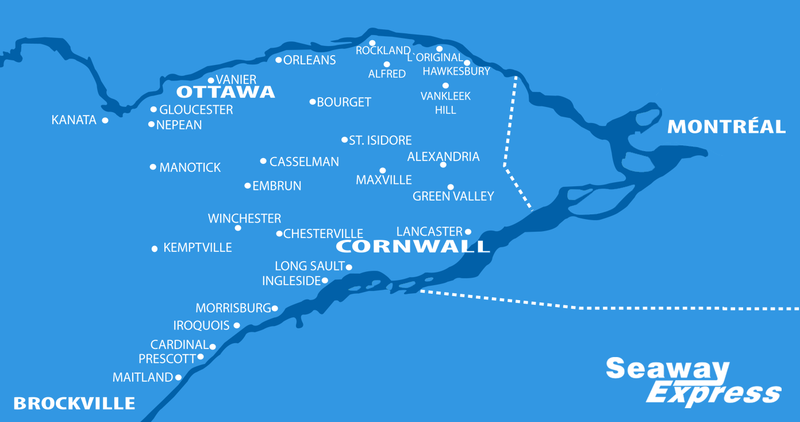 For almost 30 years, Seaway Express has been offering high quality LTL, TL, and appointment services throughout Eastern Ontario and Quebec. Our exceptional standards sets us ahead of the competition for local and regional pick up and deliveries. Being the closest transportation terminal to the Wal-Mart (SCM) and Shopper’s Drug Mart (Matrix) distribution centres in Cornwall enables us to provide on-time deliveries for vendors seven days a week. Whether acting as agents on behalf of carriers or direct to shippers, we are confident Seaway Express will meet and exceed all expectations regarding your transportation needs. Please contact us today to see how Seaway Express can add value to your company and supply chain requirements.